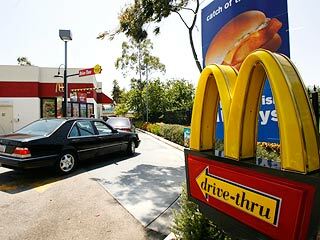 In a surprise move that flies in the face of every thing the small oceanfront community has been about, Ocean Beach officials announced Thursday that fast-food burger giant McDonald’s will open up a location along Newport Avenue. Many members of the Ocean Beach community were opposed to the kind of corporate expansion that saw Seattle-based coffee franchise Starbucks open its doors in OB a few years ago. There was much controversy that the corporation’s presence was a sign of homogenization of the town’s longtime anti-corporate values. Still, there are some who welcome the McDonald’s opening as evidence that the move is actually authentically OB. The owners of Hodad’s could not be reached for comment. The ever-growing homeless population in Ocean Beach is also in favor of the move. It makes sense too, as more restaurants equals more people, more people equals more loose change, and more loose change equals more chances to buy McNuggets. “It’s the natural cycle of life,” said one homeless man who asked not to be identified. There will undoubtedly be opposition to the move as well. Town Council officials said they expect that residents will more than likely complain about a lack of parking along Newport Avenue, especially on Filet-O-Fish Fridays. Members of the Ocean Beach Main Street Association were originally displeased with the move, but see that it has benefits. Oh… and by the way. April fool’s. it says there on Facebook (it’s on the OB Rage page, so it must be true) that editor Frank G has SOLD OUT and is shamelessly working for the McDeath Corporation. Shame on you Frank! Unfortunately, the location is going to displace Willie’s ShoeShine shack but, besides that, I’m really going to enjoy the smell of of those greasy fries all day long. It’s about time we see some real corporate interest in this town. Not realizing what day it was (losing track of days) I nearly died thinking I’d come home from Afghanistan to see a McD on Newport. For a second my soul was crushed. well done. I was hoping for an official Blackwater merchandise outlet…..
ha ha ha – ouch! Well, imagine the “rush” I had when I originally read it today at SDNN during my first cup of coffee. And actually, I’m pretty sure I have seen the Hamburglar hanging out smoking blunts under the pier. DAMMIT! I was all prepared to go home and start packing. Time to leave OB when the Golden Arches show up. Although I had an inclination that it was all a horrible April Fools jest, it felt like a nightmare to read and actually consider, Perish the thought of McObesity on Newport. I was ready to craft protest signs and walk the line. McDonalds has changed over the years. Cardboard recycling, energy efficiency, and getting rid of those styrofoam clamshells and cups. However you can still get your food to go in a styrofoam container at many OB restaurants. McDonalds has changed, but they still serve a food-like substance instead of food and last I heard they’re still razing rainforests to grow cows, but my information could be outdated. Larry, you need to watch Food, Inc. if you’re falling for all the energy efficient stuff they’re advertising. McDonald’s monopolises the meat industry and tells them how to raise their cows – on corn! Since when do cows eat corn??? Wonder if they could build it “old school style” like the 60’s red white and yellow burger stand look they discontinued, Old style uniforms…and all. People might be a little warm to something like that. Can’t believe there’s no huge fight over this. THAT was Mean?, Genius?…. I was having flashbaacks to the HONK TO STOP WINCHELL’S banner!, petitions, etc etc, (see old O.B, Rag). What a nightmere that was! (except the sweet smell of sucess!) Glad I read full article before I got on the line spreading nasty roomers! There is already a Jack in the Crack, so would it really matter if there’s a Micky Dees? Besides, Hodad’s will still dominate the OB burger scene. Hodad’s is my favorite burger, but it’s not worth standing in line for two hours. That’s why I get my OB burger fix at the Tilted Stick. Maybe Ronald’s place will alleviate the problem a bit. Ya(or who ever “SOURCE” is) duped me LOL. Being the easiest person to fool (i.e. gullible), I hate April Fools Day. I almost had a heart attack. I was April fooled;) I didn’t read the last line. Damn you Frank !!!! you nearly had me thinking of leaving town. I sort of resented SDNN’s attempt at making fun of OB’s aversion to corporate franchises. My immediate reaction was to write a post about the OB Rag buying SDNN for April Fool’s Day. I hope this doesn’t act like the little boy crying ‘wolf’. It better not. I think we should train all those cameras at the McD’s and then transform that fascist tower into a pressure cooker for hot dogs boiled in beer. It now looks like the Department of Homeland Security is behind the new rise to fascism in the U.S. police departments w/ all those grants. Stop paying taxes. Start tagging cameras. What’s next? A sound cannon?